In his previous book Reiki Shamanism, Jim Pathfinder Ewing first introduced us to his unique way of combining the powers of shamanism and Reiki. Here in Dreams of a Reiki Shaman he takes us deeper into his world, his way of working and shares with us insights into his own practice. The 1st chapter on Apprehending Reality is a fascinating look at how we may experience expanded states of non-ordinary reality. Quantum physics is used in a very real and practical way to help us understand that; “What one sees and touches is verifiably; Nothing”. By comparing the shaman’s and scientist’s ways of looking he shows us how although both views are equal valid and relevant, the shaman’s view is more expansive and thus gives a different perspective. The section in chapter 1 is both entertaining and thought provoking explaining how our minds dismiss the glimpses of non-ordinary reality or the ‘little people’ as we move through our day. 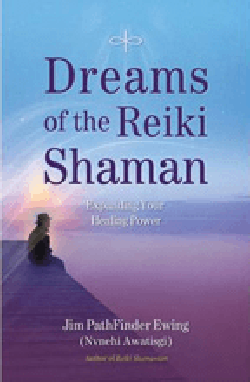 Chapter 2 looks at shamanic journeys and the work of a Reiki Shaman in terms of the healing session. This is where, through the sharing of his own experiences and the experiences of his clients, Jim Pathfinder Ewing gives us clear explanations of how he works to remove unwanted energies and to retrieve power animals and soul pieces. In the final chapter we are given more insight into ways of dealing with malevolent spirits, energetic cords, using spirits to provide protection and how Reiki may be used to protect. Explanations and examples of working with light beings or allies, psychopomp, and journeying into past and future lives are also shared. Although there are a few exercises in Dreams of the Reiki Shaman the book’s real strength comes from the examples of Jim Pathfinder Ewing’s own work. It is here that those who practice Reiki and Shamanism may find new ideas for their own work or even, as I did, look at similarities and differences in ways of working and thus view their own work in a new light with new understanding. It also gives one of the simplest and clearest explanations of psychopomp I have seen anywhere and takes away a lot of the fear that other authors sometimes generate around some aspects of shamanic practice. For anyone interested in healing, Reiki or shamanism, this book is a real gift, a generous sharing of first hand experience which may open doors to new ways of perceiving reality.